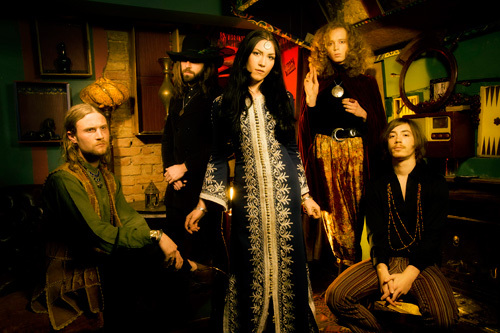 Purson, the London-based quintet Pitchfork recently described as “eerie“ and “whimsical,” is currently streaming their debut album, The Circle and The Blue Door, via Spin HERE. The 11-song album is set for an April 30 release via Metal Blade/Rise Above Records and has been dubbed “best debut of 2013” by Decibel Magazine with overseas outlets like Kerrang (“the best bits of ’60s and ’70s rock – think Sabbath, Led Zeppelin, Pink Floyd, Cream… brought to 2013 in a sweet-smelling musical haze”), BBC (“a modern demonic sound”), Terrorizer (“their brand of gothic psychedelia is set to take 2013 by storm”) and Subterranea/Metal Hammer (“Purson are the UK’s new ambassadors for the otherworldly”) all championing the young UK outfit. This entry was posted in METAL and tagged BBC, Chris Martin, Decibel, Entertainment, gaming, Led Zeppelin, London, Marrakesh, Metal Blade Records, Music, Pink Floyd, transportation. Bookmark the permalink.